Sprouting grains, beans and legumes is a time-honoured tradition passed down from our wise ancestors thousands of years ago. Many to this day continue to sprout in their own kitchens and among their families to reap the incredible health benefits of these beans, grains and legumes all year long. In this blog, we’ll be taking a closer look at what sprouting is and why it’s vital to our health. Let’s look at this in more detail! Soaking and sprouting is a very old practice that caries huge nutritional benefits. This process can be used on grains (such as spelt), oats, beans, nuts, lentils and other seeds like quinoa. The process essentially involves submerging your seeds in water (preferably overnight), draining them and watching them grow! This allows the seeds to amplify in available nutrition to the human body and break down any anti-nutrients including phytic acid. There are many foods that can be sprouted including vegetables, grains, beans and legumes. While some are hardier and can withstand more heat, others can be more delicate and fragile. Sprouting essentially boosts the nutrition that is available to us from the seed. Each seed, by nature, is coated in phytic acid, a natural substance that prevents the seed from being broken down in our digestive tract. This phytic acid is nature’s way of protecting the seed from being eaten by animals, birds and insects before it hits the soil and grows. When we take a seed and sprout it, we essentially break down the phytic acid barrier so that our digestive systems can absorb all the abundant nutrition provided by each seed. The phytic acid apparent from unsprouted seeds reduces the amount of vitamins and minerals available to us. Sprouted foods are superfoods because they are extremely abundant in enzymes, which act like catalysts in our body that allow multiple bodily processes to function more efficiently. Sprouted foods also contain concentrated amounts of vitamins, minerals and antioxidants including zinc, vitamin B12, vitamin C, riboflavin, and more! When digested they naturally alkalize the body with their unique nutrient-dense profiles, helping the body offset any effects of stress and a potentially poor diet. These sprouted foods also contain much more available digestible protein, making them great for weight loss and regulation. Sprouted foods are typically low calorie, high in fiber and incredibly dense in nutrients, making them well-loved among health advocates and families alike! Chickpeas, also known by many as garbanzo beans, are protein and fiber-rich legumes that were originally prepared in the Middle East before becoming universally known and eaten by people all over the world. They are prepared in numerous ways including playing a star role in traditional recipes such as hummus and falafel, as well as can be simply added over salads, in a soup or ground into a flour for baking. While this versatile legume is delicious, what’s more impressive is it’s list of several key vitamins and minerals, as well as health benefits. Chickpeas’ high fiber content can contribute to lowered and stabilized blood sugar levels and blood pressure, aiding those living with diabetes and high cholesterol. This legume’s impressive list of nutrients including zinc, vitamin K, magnesium, iron and more also help encourage strong bone structure and balance, along with collagen production. This legume can also cause a reduction in bodily inflammation due to its choline content while promoting healthy bowel function and staving off unhealthy weight gain. At Shasha Co. we soak and sprout our chickpeas for optimal nutritional value and better digestibility for our loyal customers and their families to enjoy the incredible health benefits. To learn more about our Shasha Co. Sprouted Chickpeas and for recipe inspiration, click here (http://www.shashabread.com/products/chickpeas). Brown rice is sometimes referred to as whole grain rice because it essentially is a whole-grain rice whose outer layer (called its husk) has been removed for our consumption. While white rice has undergone a process of having its outer husk, bran and germ removed, brown rice still maintains is other nutrient-rich counterparts. These nutrients include vitamin B6, iron, magnesium, selenium, niacin and many more, which are kept intact along with the bran’s oil and fatty acids—nutrients you would otherwise miss from white rice. Sprouted brown rice has been soaked and germinated before cooking, making the grain’s enzymes more available to our bodies in digestion and allowing us to reap more benefits from it’s now more nutrient-dense composition of amino-acids. This traditional preparation from centuries past is a process we honour and keep with Shasha Co.’s Bio-Bud Sprouted Brown Rice. Because of this, we are able to provide our consumers with a rice that’s is more nutritious while also allowing for less time spent on meal preparation for busy families. To learn more about our Shasha Co. Sprouted Brown Rice and for recipe inspiration, click here (http://www.shashabread.com/products/brown-rice). Lentils are a legume that we have been consuming for many centuries. They come in a variety of colours including green, brown, red and more. These naturally gluten-free legumes grow in pods and are most commonly found in Indian and Asian dishes including curries and split-lentil dals, as well as traditional Ethiopian stews. These small humble legumes contain protein and are a healthy source of carbohydrates boasting nutrients such as folate, zinc, iron, phosphorous, potassium and other essential nutrients including many B vitamins and fatty acids. Like chickpeas, lentils are incredibly beneficial for those with diabetes because its starch is more slowly digested by the body, reducing glucose spikes and stabilizing blood sugars. Including lentils in your diet can also help increase your body’s iron levels, while helping support red blood cell formation via its B vitamins. Like many other legumes, lentils also contain anti-nutrients like phytic acid, making them less digestible by animals and humans. By traditionally soaking and sprouting our lentils, they become more easily digested, allowing our bodies to access their nutrient-dense profile and utilize these nutrients in everyday bodily functions. Our Shasha Co. Bio-Bud Sprouted Lentils are soaked and sprouted with care to assure our customers can reap the incredible health benefits of this legume in the most efficient way. To learn more about our Shasha Co. Sprouted Lentils and for recipe inspiration, click here (http://www.shashabread.com/products/lentils). Mung beans are small, green nutrient-dense legumes prepared for centuries in traditional Indian and East Asian cultures. Many may recognize bean sprouts from Asian stir fry dishes, which are sprouted from the mung bean. This versatile legume is also easy to top over salads, as well as in warm soups. Mung beans are powerhouses and contain many essential nutrients and health benefits. They’re rich in protein and carry a vast amino-acid profile including leucine, lysine, valine and more. When soaked and sprouted, the availability of amino-acids, vitamins and nutrients of these mung beans increases greatly. Consumers are then able to reap the nutritional benefits of this legume’s antioxidants, vitamins and minerals including folate, potassium, zinc, phosphorus, manganese and more! At Shasha Co. we take great provide in providing these nutritious legumes in the best and most available way possible to our consumers. Our customers are able to enjoy the health benefits of our Shasha Co. Bio-Bud Sprouted Mung Beans with the added bonus of shortened cooking preparation times. To learn more about our Shasha Co. Sprouted Mung Beans and for recipe inspiration, click here (http://www.shashabread.com/products/mung-beans). Adzuki beans, sometimes called the red mung bean, is most recognizable as a popular ingredient in Japanese desserts, but can also be found in different preparations of other Asian and Indian cultures. Adzuki beans originated from China and Japan, and were later cultivated in South America, India and the United States. Like many of the previously mentioned legumes, adzuki beans boast health benefits that can help those with diabetes as well as individuals with digestive issues, heart conditions, high cholesterol and cancer. Adzuki beans contain a lot of fiber and antioxidants, helping consumers stabilize weight while promoting anti-aging, healthy bone formation and strength. As with many legumes, the traditional process of soaking and sprouting helps to unlock the nutrient-dense profiles of mung beans, allowing our bodies to access these enzyme-rich powerhouses which are then able to help our bodies function optimally. By incorporation this sprouted legume (and many of the others mentioned) into their diets, consumers are able to add more nutrition to their meals while still enjoying the traditional preparations and recipes these legumes are most known for. Our Shasha Co. Sprouted Adzuki Beans are easy to digest and are packaged with care to assure each consumer gets the most nutrition possible from these superfoods. To learn more about our Shasha Co. Sprouted Adzuki Beans and for recipe inspiration, click here (http://www.shashabread.com/products/adzuki-beans). Since 1999, Shasha Co. has been honouring the traditional process of germinating, sprouting and fermenting in order to offer their loyal customers convenient and easy to prepare family food staples that are naturally healthy and contain the most nutrient-dense properties. At Shasha Co. we carefully germinate and sprout our grain, legume and bean products utilizing traditionally perfected techniques that allow these foods to reach their highest enzyme activity, increasing their nutritional value by at least 3 to 4 times. These easy to prepare foods include a variety of our Bio-Buds, along with our new line of Sprouted Blends which are all vegan, organic, non-gmo kosher and halal! Some of these nutrient-dense side dishes include our Mediterranean-Style Basmati Rice, Moroccan-Style Pearled Couscous and more! 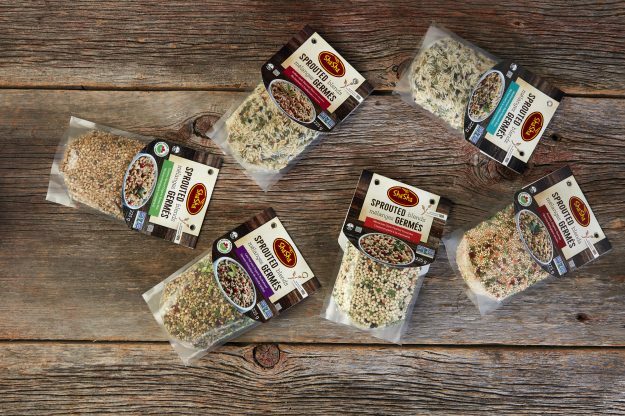 Our line of Bio-Buds include sprouted Chick Peas, Adzuki Beans, Mung Beans, Lentils and Brown Rice. These nutritional superfoods not only boast a whole host of essential nutrients and amino acids like vitamin C, vitamin B, thiamin, niacin, calcium, magnesium and more—they also work incredibly hard in our bodies to prevent illness and disease in the liver and intestines while helping to keep our blood sugar stable, preventing diabetes, lowering blood pressure and reducing any chance of heart disease while also promoting hormonal balance. There are numerous ways for you and your family to enjoy these nutrient-dense sprouted products including as side dishes, atop salads and wraps, or even cooked into your stir fries, stews, soups and casseroles. Our Sprouted Blends and Bio-Buds have all been soaked, sprouted, dehydrated and packaged for easy cooking for our busy customers so they can enjoy their time with family. As pioneers in the modern food industry, we here at Shasha Co. are incredibly proud to have provided individuals and their growing families with the most nutrient-dense foods in a way that is most convenient for them. After 20 years of perfecting these ancestral processes, we promise to continue to value these traditions for another 20 years and beyond! To learn more about our range of Bio-Buds and new Sprouted Blends, as well as access to various recipes, click here (http://www.shashabread.com/product_types/shasha-sprouted#noFB). Like this article? Show you care and share!